Brides with bangs, it’s certainly not the ‘traditional’ look but it is a bold bridal look. A lot of women with bangs will tell you that bangs are part of their identity and they aren’t about to go pinning them back or sweeping them to the side on their big day. More and more brides are wearing their bangs with pride. Bangs are a great way to frame your face and create a beautiful unique hairstyle. Bangs also look great with every theme; rather you are going for a boho look, a beach beauty, or sticking with the Disney princess look then your bangs will compliment your style. 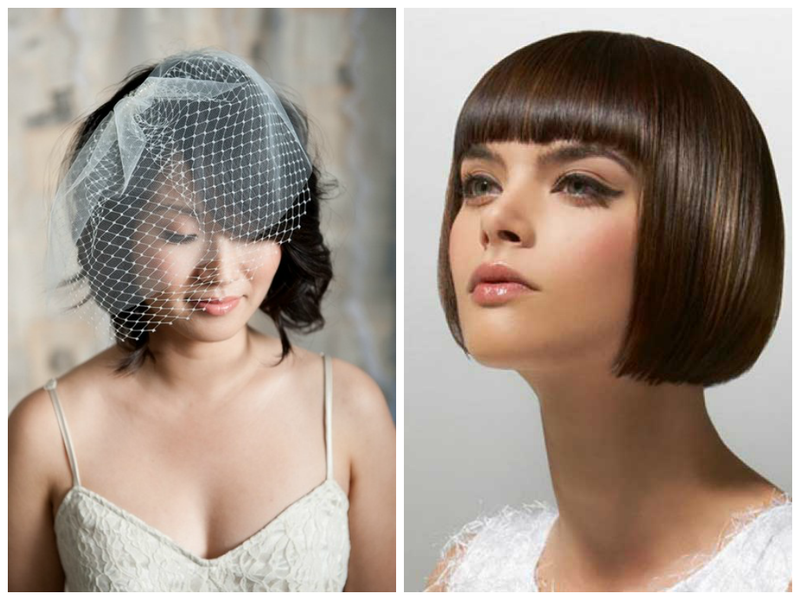 Let’s take a look at some brides with bangs and give you some inspiration for your big wedding day. A short bob with blunt fringe is ultra-chic for your wedding day. It’s fun and flirty for those summer weddings with a relaxed feel. Blunt bangs and bobs were made for bridal looks. Bangs look great with a polished or messy up do and yes it can work well on your wedding day. You can style your bangs with braids, buns, chignons, French twist, etc. If you have blunt bangs then don’t hesitate to wear your hair up and display your bold blunt bangs front and center. By pulling a few strands down that are long than your bangs you can frame your face perfectly for an up do, or style it loose and curly for a less formal look. 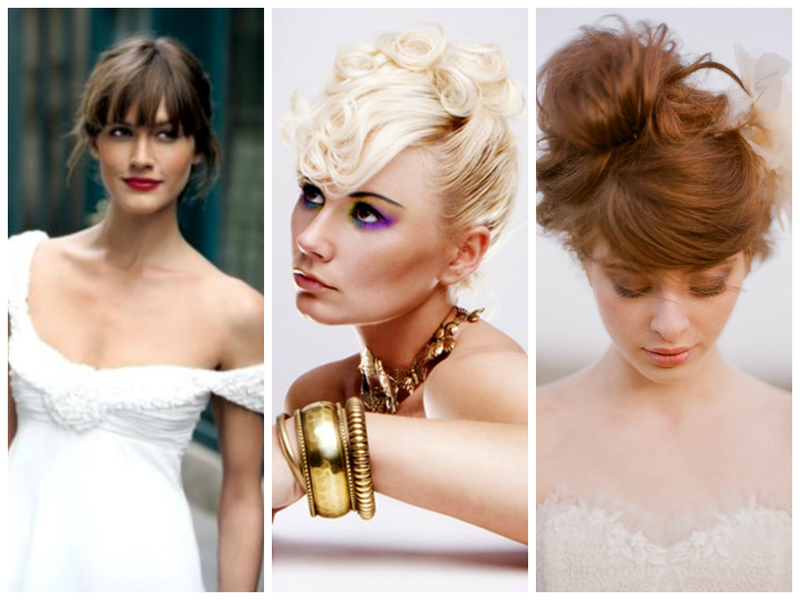 Bold up do’s for your wedding day hairstyle with bangs. If you have bangs and medium-length to long hair then by simply wearing your tresses down with a little bit of texture, a veil, and your perfectly styled bangs you will look like a bold bride with beautiful bangs. Wearing your hair down or slightly pinned back is perfect for your bridal hairstyle. 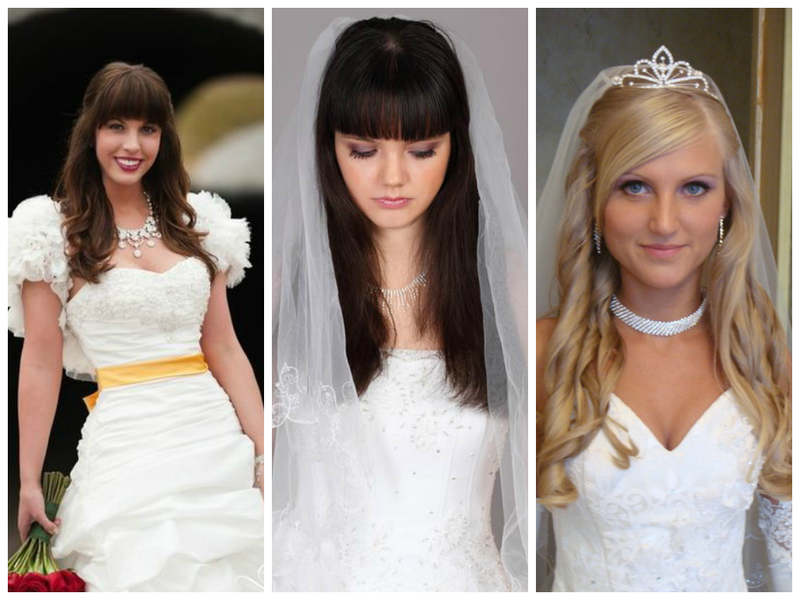 A great way to wear bangs with your veil is with a great half-up hairstyle for setting the veil. Bangs also simply look great with half up hairstyles because the pulled back upper part emphasizes the bangs but the left-down locks are a soft bridal look. There is so much variety with half-up half-down hairstyles. 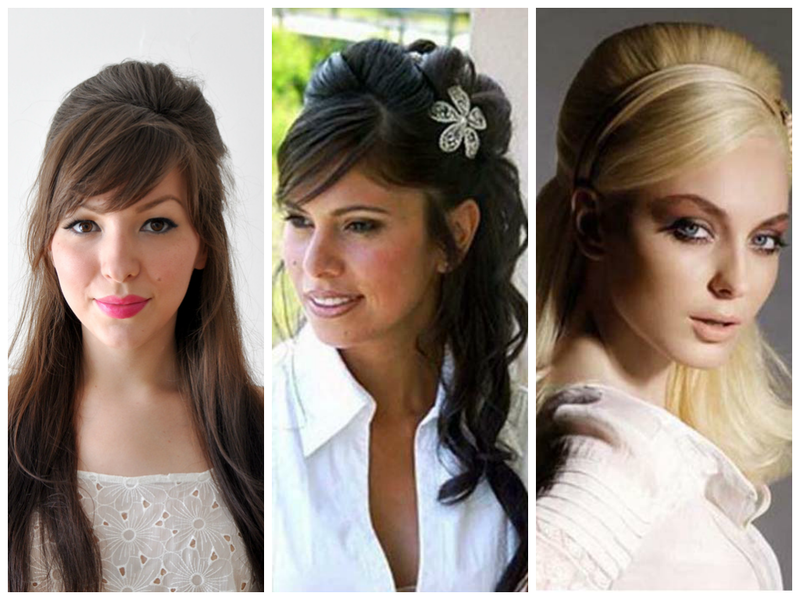 A full side-swept bang is a soft romantic look for your wedding day. If you have a short pixie haircut then you probably have some front-swept bangs. 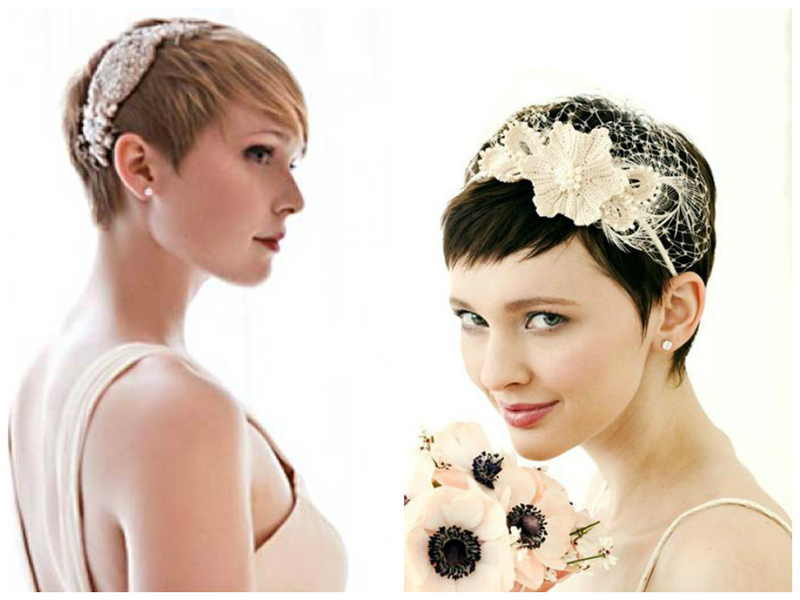 Style your pixie with a gorgeous hair accessory for a statement making wedding hairstyle. A pixie haircut with bangs looks chic and gorgeous with a statement hair accessory. 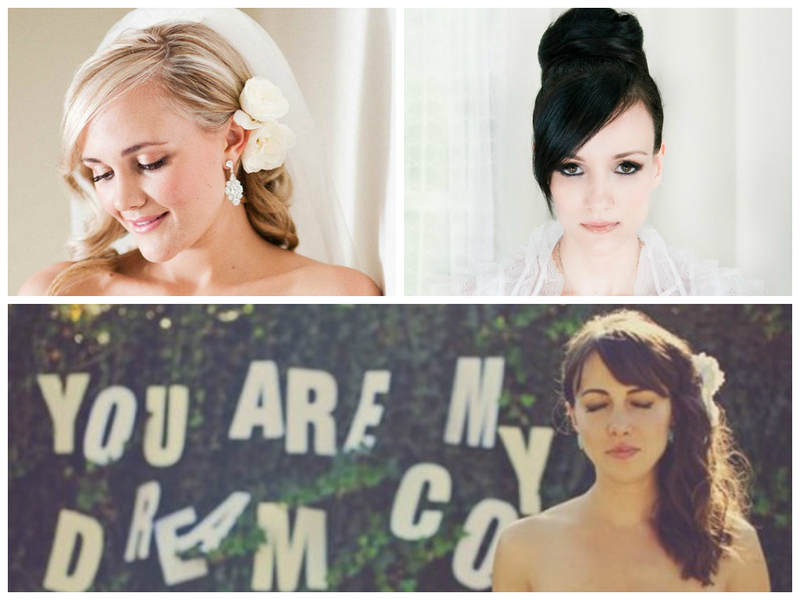 These are some of our favorite bridal hairstyles for women with bangs. Of course if you don’t have bangs your wedding day isn’t the time to try out a new haircut but if bangs are part of who you are then wear them proudly and boldly on your fabulous special day.